This is a vintage heavy 14k gold plated wide ring band with crisp, clean Austrian crystals in excellent condition. 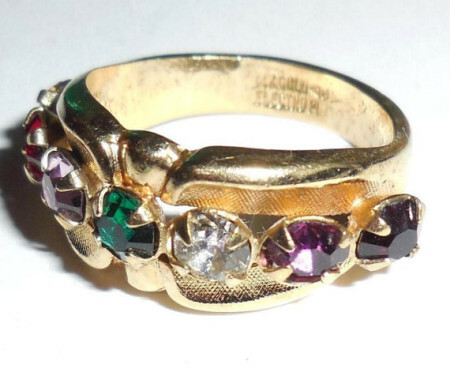 It is from the 1960s-70s and is marked 14K Gold Electroplated and has a maker mark. All gold intact. No eye visible wear. The top is 3/8″ wide across North to South. 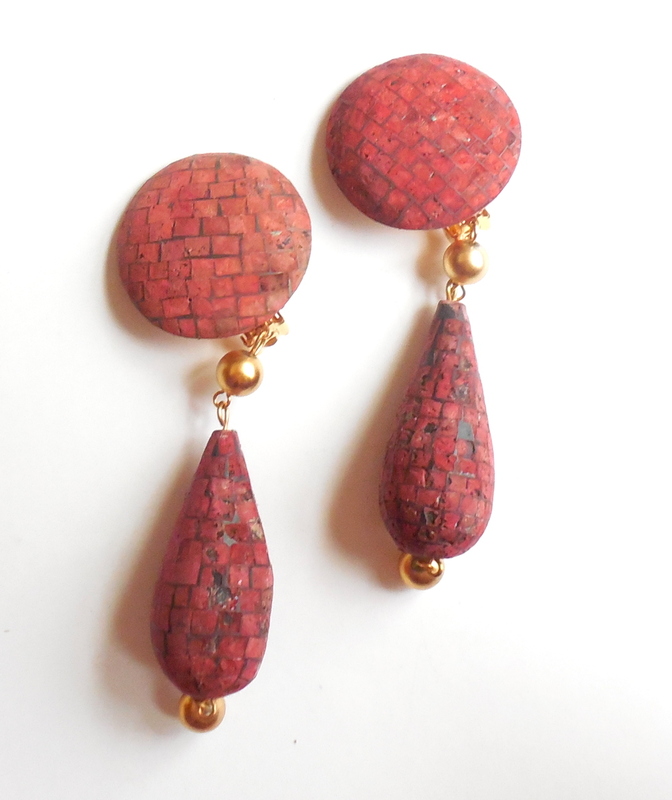 The stones are faceted and prong set. The gold plating is heavy, thick and intact. Looks like solid gold. If you are looking for a wide vintage showy band in gold then this is a nice inexpensive alternative to solid gold. 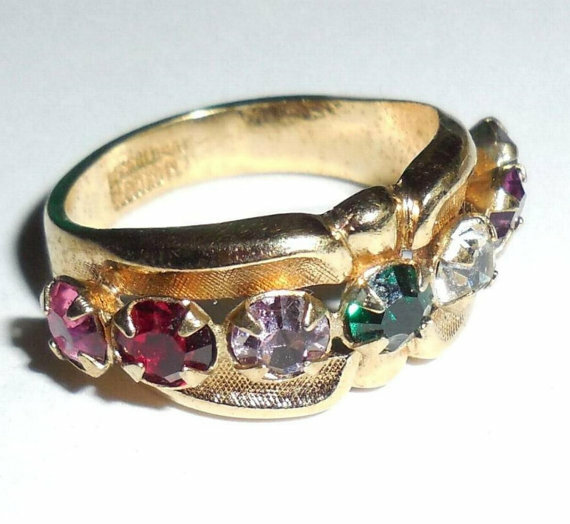 This is a lovely vintage statement ring in beautifully maintained condition for your collection. 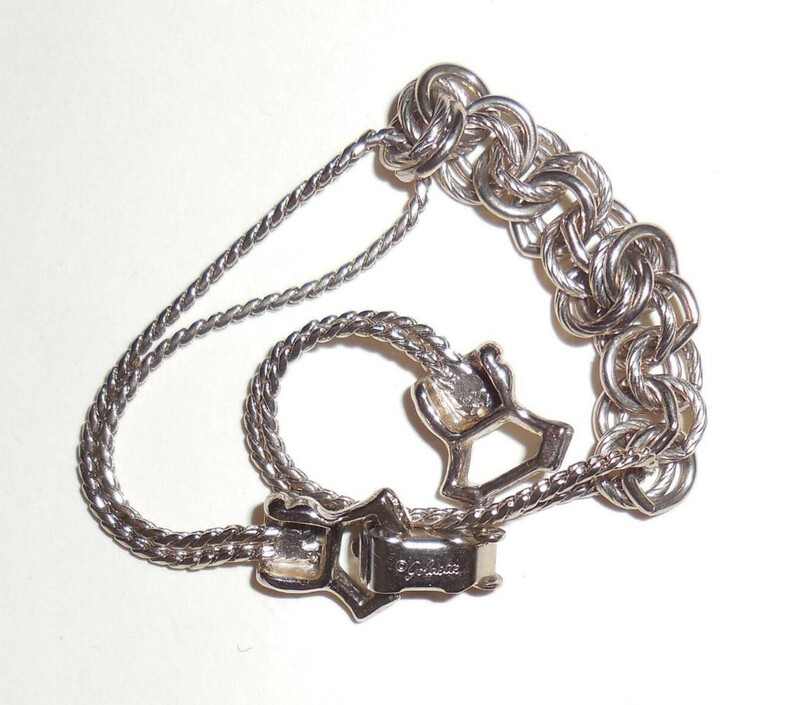 This is a vintage White Gold plated 1970s original Goldette double rolling chain link bracelet. It is marked Goldette and is old store stock jewelry that was never used. Like all vintage Goldette jewelry it is very heavily gold plated. This one is white gold. The chain linkage alternates between plain and deeply recessed. Ready to wear like new condition. Absolutely no wear at all to the gold. Still very bright and very shiny like when it was originally made. Size is 7 1/8″ long end to end laid flat with the clasp end closed. Should fit a small to medium small wrist size. Width is narrow at 5/16″ across the center so it will look good layered with other vintage bracelets. 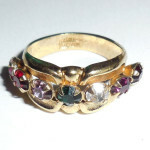 This is a lovely example of vintage 1970s Goldette jewelry for your collection. Looks good whether it is stacked with other linked bracelets or worn alone. Vintage Signed Goldette White Gold Overlay Bracelet Never Used Old Jeweler Estate Store Stock This is an original signed Goldette vintage double chain slide bracelet with a 6mm chain link centerpiece in good as brand new condition. Old store stock. It is small and delicate yet very strong and well made. It has very heavy white gold overlay that will last for many decades. The chain linkage alternates between plain and deeply recessed. Ready to wear. Absolutely no wear at all to the white gold. Still very bright and very shiny like when it was originally made. Size is 7 1/8" long end to end laid flat with the clasp end closed. Should fit a small to medium small wrist size easily. Width is 5/16" across the center. 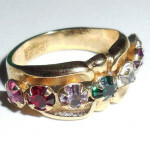 This is a lovely 1970s Goldette slide bracelet for your vintage jewelry collection. Vintage Fancy Filigree Molded Glass Lavalier Lavaliere Pendant Necklace - lovely vintage never used estate lavaliere pendant necklace in heavy YELLOW gold plate and all hand painted art glass. No gold wear at all. Late mid century, old jewelry store stock from a 1960s - 1970s jewelry manufacturer/distributor. 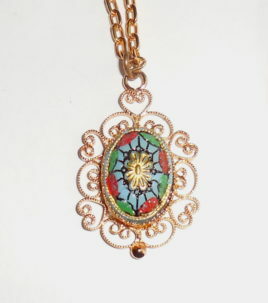 The pendant lavaliere is made of enamel painted molded glass with a mosaic look. The chaining is very heavily gold plated, and heavy duty quality. Will hold a larger, heavier pendant than this lavaliere. Total size is 18.5". Size of lavalier is 1" north to south by .75" east to wear. The chain alone is 17.5" long. 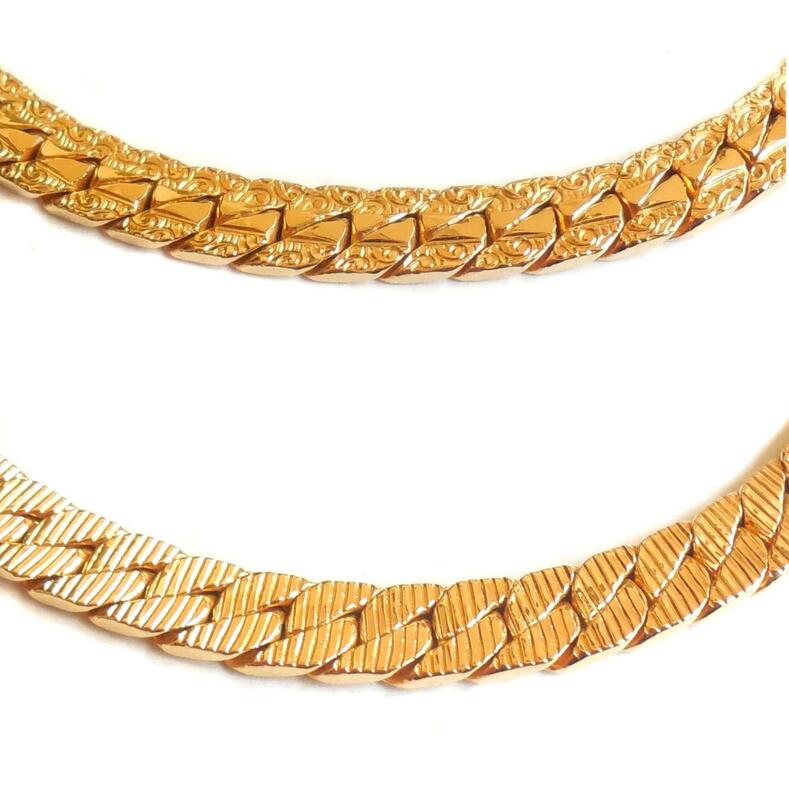 This chain is very bright, shiny gold plated and looks like the day it was originally made. No wear at all. The lavalier is also in excellent condition. Beautiful fancy delicate necklace for your vintage jewelry collection. 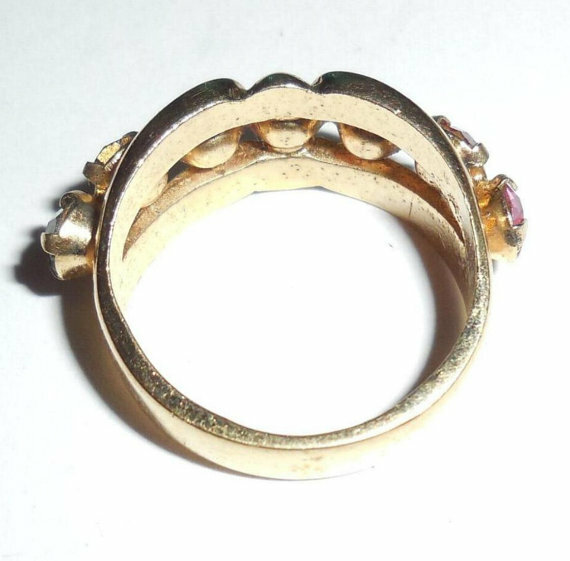 Fancy Vintage 2 Sided Gold Plated Bracelet No Wear Size 7 This is a gorgeous vintage heavy gold plated bracelet with double sided linkage in beautiful, crisp, clear, no wear condition. One side has a fancy repoussed linkage and the other side has deep linear recessed curb links. All gold is intact and still shiny and clean. No wear. Size is 7" long end to end by 1/4" wide. Thickness is over 1/16". It is nice and weighty with good thickness, substantial and very well made. The dual sided linkage makes this piece great for any type or use......daytime daily use, evening, special occasion etc... This is a lovely vintage statement bracelet that is very versatile for your collection!.